Several years ago my son introduced me to what I consider a life-changing book: Crucial Conversations by Kerry Patterson, Joseph Grenny, Ron McMillan, and Al Swizler. This book gave me tools for tackling difficult conversations in a way that would ensure that both parties understood each other and came our winners. It’s a book I have to return to often to refresh my memory as I work on my communication skills — there are many lessons to remember and these changes don’t come easily! As I’ve been working to help high school students develop their leadership skills, I’ve taught them the use of “I” statements, how to apologize sincerely, and how to monitor their body language to convey respect and openness. But, as students faced difficult conversations, I realized that I had never explicitly taught them how to manage these. 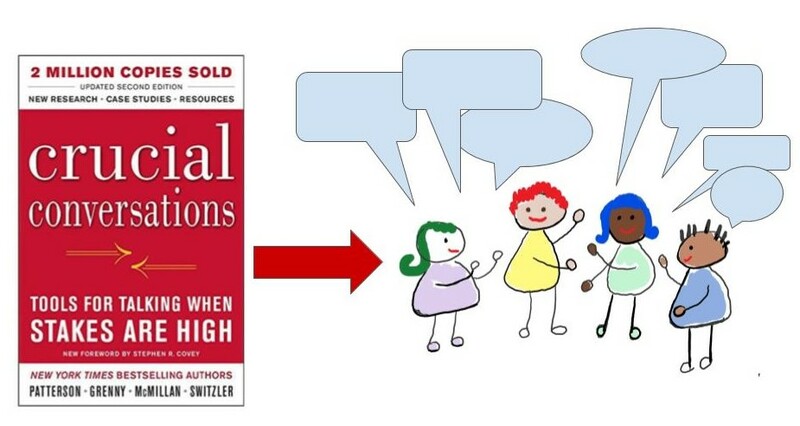 I thought that the lessons in Crucial Conversations were a great way to empower students. But at the same time there’s so much to learn… how could I simplify these lessons so that my students could remember them and put them to use quickly? One of our high school classes was having difficulty agreeing on fundraisers and making decisions as a class. *Anna, the class president, and *Pedro, the vice-president, came to ask me how to manage a few students who tended to be negative — complaining behind their backs, mumbling dismissive comments during class meetings, and generally getting in the way of decision-making. I decided this would be an opportunity to teach students how to lead a crucial conversation. I started out with a few simple lessons. What is it that both parties have in common? What does everyone want? Make this clear so that everyone knows they’re working toward the same goal. Listen mindfully to what the other person has to say. Paraphrase what they say to make sure you’ve understood. Use open and relaxed body language. Make sure your facial expression is friendly. If the other person feels hurt by your actions or words, apologize sincerely. Watch for “flight or fight” reactions which show that someone is not feeling safe. When you notice “flight or fight” reactions, it’s time to step back and make people feel safe. Remind them that you’re both looking for a common goal. Explain that you want to hear everyone’s opinions before you make a decision. Show interest in what the other people have to say. Allow all voices to be heard. Use good listening skills — take notes, paraphrase ideas, and use clarifying questions. At the end of the conversation, try to find a solution that makes most people happy — either by vote or consensus. How will the solution be put into action? Decide who will do what. Make a timeline if appropriate. After I went over the basics with Anna and Pedro, they asked the three students who were giving them problems in to discuss how they could improve classroom meetings. I was simply there on the sidelines to observe and mediate if necessary. Before the conversation, I asked everyone to use “I” statements rather than statements of blame. I was happily surprised at how the conversation went:. Anna set a common goal (we want to have effective meetings where we can all contribute and we want to be able to make decisions together) and asked if the three students agreed. They did. She followed by asking the students how they were feeling. Their responses showed a lot of pent-up anger and hurt feelings. These students were not feeling heard in class meetings — they felt that their opinions were ignored and they acknowledged that they were reacting by sabotaging class meetings. Anna and Pedro took responsibility for the hurt they had caused and sincerely apologized, explaining that they had not been aware of the way they were perceived and would take care to improve. There was a noticeable lessening of tension in the room as soon as they apologized. The three students began to smile more, and their body language showed openness. By the end of the conversation, the five students had agreed on protocols they would use to make the class meetings run more smoothly and to ensure that all student voices were heard. When I debriefed with Anna and Pedro they admitted that they weren’t aware of the feelings some of the students had. They had been feeling under attack without taking into account that they were also responsible for some of the class negativity. They were surprised at how effective the conversation had been for clearing the air and finding solutions to their problems. We discussed the fact that this wasn’t a magic bullet — they were going to run into a number of conflicts throughout the year, but the skills they’d learned would help them navigate these difficulties. If you haven’t read Crucial Conversations, I highly recommend it for improving leadership skills. Effective communication is an important life skills to teach our students. If you have any any other methods you use to help teach kids to communicate more effectively, I’d love to hear them. Here are some reminders of the steps I taught my students. feel free to pin, print, or share to keep these tips handy — for either yourself or your students!